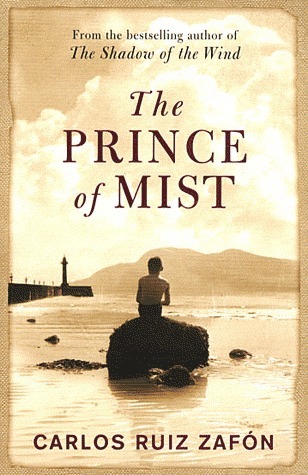 The Prince of Mist is a young adult novel by Carlos Ruiz Zafón, written in 1993 and translated from Spanish into English in 2010. The main character is a young boy called Max Carver. In 1943, along with his two sisters, his mother and watchmaker father, he moves to a little town by the sea to get away from the war. As soon as they reach the new place Max realises things aren’t quite as they should be. Max discovers that the new house was formerly owned by the Fleischmans, whose family is surrounded by tragedy after the death of their son, Jacob. The house is pretty normal; big, old and full of strange noises, but nothing out of the ordinary until Max finds the sculpture garden near his house. I loved this book. It’s so atmospheric, and unless you have zero imagination it’s very easy to visualise every scene, right down to smells and subtle changes in the light and temperature. Considering this book is a teeny tiny 200 pages, it feels epic – there is a real sense of something much bigger; like this is a little snapshot in time in a story that spans generations. With that in mind, it was a little difficult to appreciate the immediate depth of the relationship between Roland and Alicia, who seemed to fall in love in one afternoon. But at 15 you fall in love at the drop of a hat so it’s not totally unbelievable. The Prince of Mist is a creepy baddy. This is essentially a children’s book but I had to take a little break near the end – it gets scary and I was totally there, living it with them. I think above all this is a story about bravery and loss, and it feels very pure. It’s beautifully written even if it’s completely chilling and frankly sinister in places.